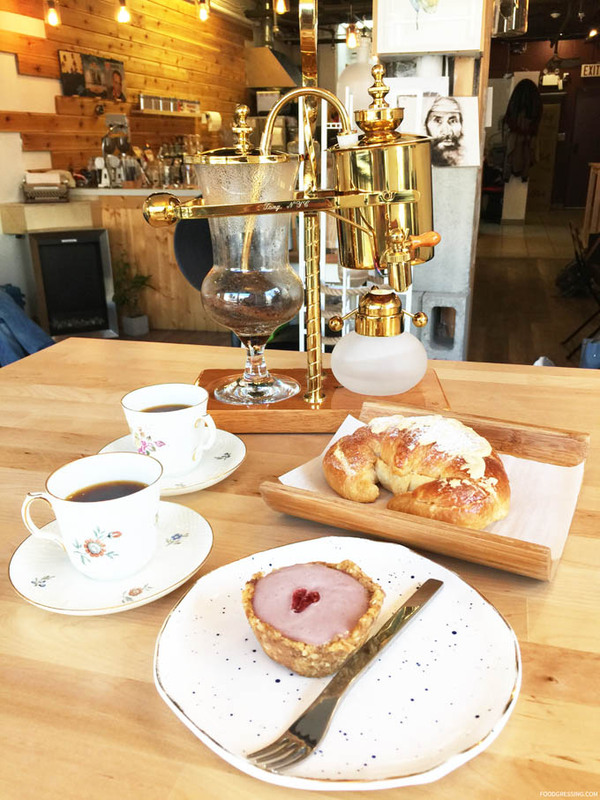 It might be difficult to fathom a place in Koreatown that can offer an elevated coffee experience likes ones you would find in Gastown and Kitsilano. 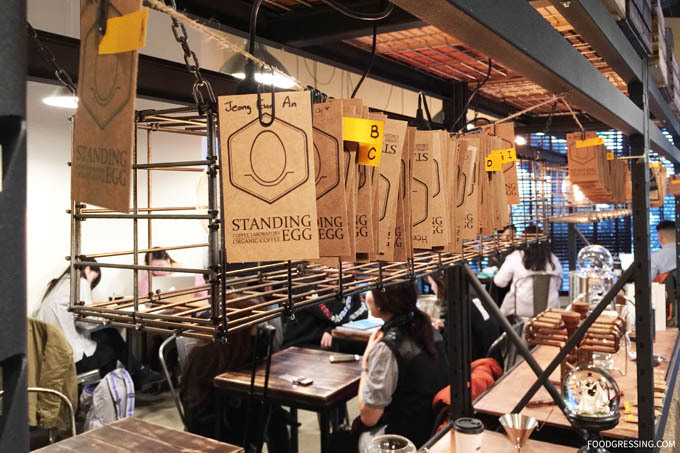 But tucked away in a corner of a multi-level Korean plaza is Standing Egg Coffee that is likely to satisfy coffee aficionados. After seeing some Instagram posts about them (including affogatos and 3D coffee art), my friend and I decided to pay them a visit. Note: This is not a sponsored post. This food and drinks were not complimentary. I did not receive any compensation or incentive to share about my experience. The coffee shop did not know that I am a blogger. 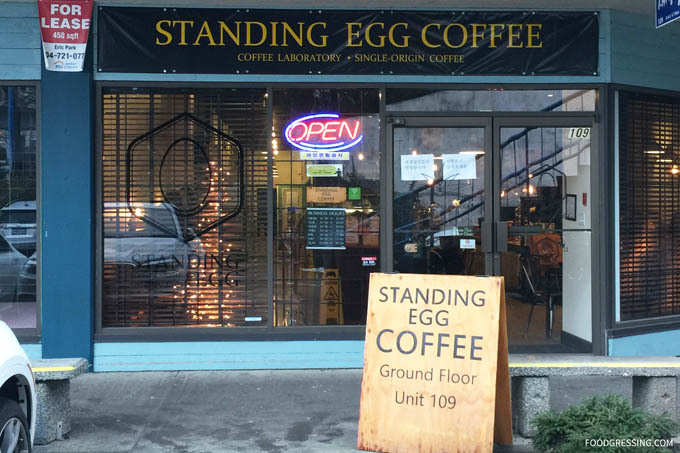 Walking into Standing Egg Coffee, I immediately took notice of the sophisticated yet moody interior. The shop has practically no natural light coming through, but I like how their design still sets a cozy environment with the overhanging industrial lights and warm, earthy tones. The main focus of the room seems to be the shelving unit in the middle featuring a display of coffee brewing equipment. On top of the unit are several pallet boxes lined up two rows. They also have set up a hanging rack of loyalty cards arranged alphabetically. It seems like a practical idea so that customers won’t need to carry an extra card on them. 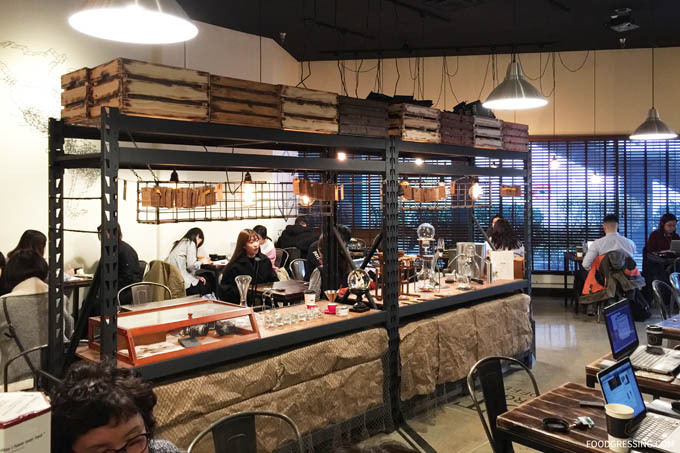 On the side walls, an eye-catching display of several cold brew coffee drippers. 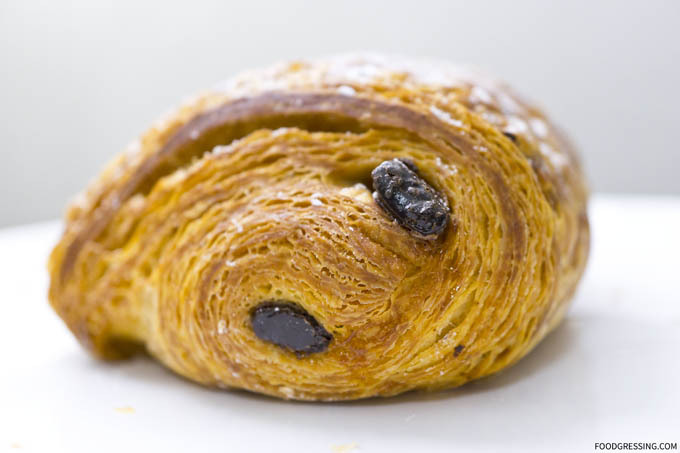 Standing Egg Coffee uses coffee beans by Calgary’s Phil & Sebastian and serves pastries by Chez Christophe. 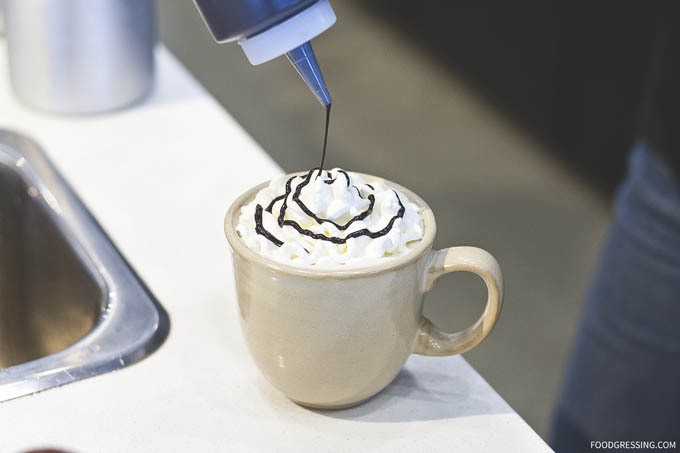 One of the things that my friend and I were looking forward to at Standing Egg Coffee were the 3D coffee art. They had advertised their 3D foam bear coffee art a few times on their social media. When we placed the order, the barista told us that it could only be created for the cappuccino. We were fine with that but then the barista said that they normally don’t do 3D coffee art during peak times as it takes too long to create it. I was a little taken back by it considering how much they advertised the 3D coffee art on their social media. Furthermore, they did not note that it was to be offered during non-peak times only. After letting her know that we had come from Downtown Vancouver, she begrudgingly decided to make it for us. When we got our cappucino with the 3D foam bear, it certainly was less impressive than the ones they advertised. The one we got was considerably less foamy. It was still cute but disappointing. We also had a matcha affogato which had vanilla ice cream in a glass and then matcha green tea on the side. Pouring the matcha green tea over vanilla ice cream created a dessert with a rich, creamy taste but also slightly bitter. The Chez Christophe pastries that we had were the Sweet Potato Cake and the Tea Tart. The cake had sweet potato chunks and whipped cream layers in a sponge cake. The tart had tea anglaise, blueberry confit, English breakfast ganache in a sweet crust. Both were okay and were more sweet than pastries I have had from Thomas Haas. The cake was light and fluffy with appropriately sized potato chunks. The blueberry confit could be less sweet and the crust was a little hard to cut through. 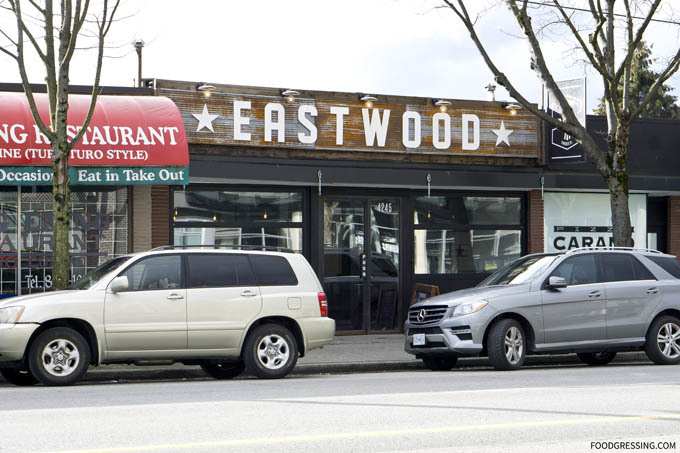 New in Fraserhood is a neighbourhood pub, The Eastwood, which opened this past December at 4245 Fraser Street. 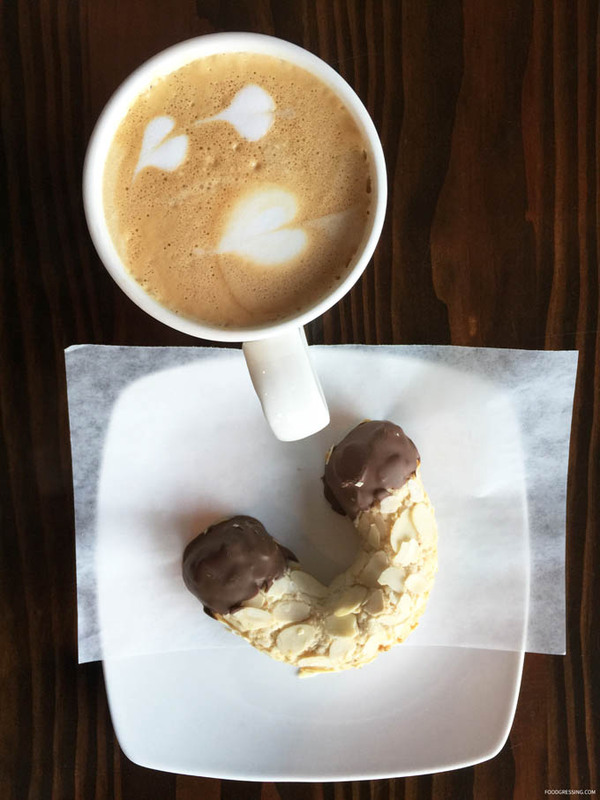 The Eastwood is a refreshing addition to the area which has been popular for coffee aficionados due to Prado Café and Bows & Arrow Coffee Roasters. 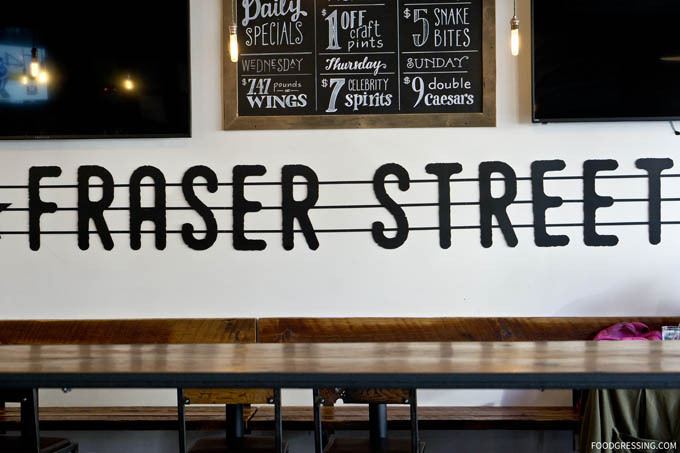 The concept behind The Eastwood is a laidback, local bar where people can come to enjoy comfort foods, have a few drinks and watch a hockey game on one of their many flat-screens. I was recently invited by The Eastwood to learn more about their story and their menu offerings. Disclosure: I was invited for a media tasting. All food and drinks in this review were complimentary. Opinions are my own. The owners of The Eastwood, Alex Kyriazis and Ari Demosten, built and designed The Eastwood’s interior. Kryiazis owns a design and fabrication company and has manufactured reclaimed-wood furnishings for restaurants like MeeT on Main. The dining area has a capacity for 60 people and is mainly of steel and salvaged wood. The room feels like it has a lot of character but with a rustic kind of feel. The dishes served at The Eastwood have Tex-Mex and Asian influences. For starters, there are classics like nachos, wings, tacos followed by some trendier items like tuna poke. Fries lovers will be impressed by The Eastwood’s variety of fries options by Spuds including Fraser Fries, Chili Cheese Fries, Lemon Pepper, and poutine. 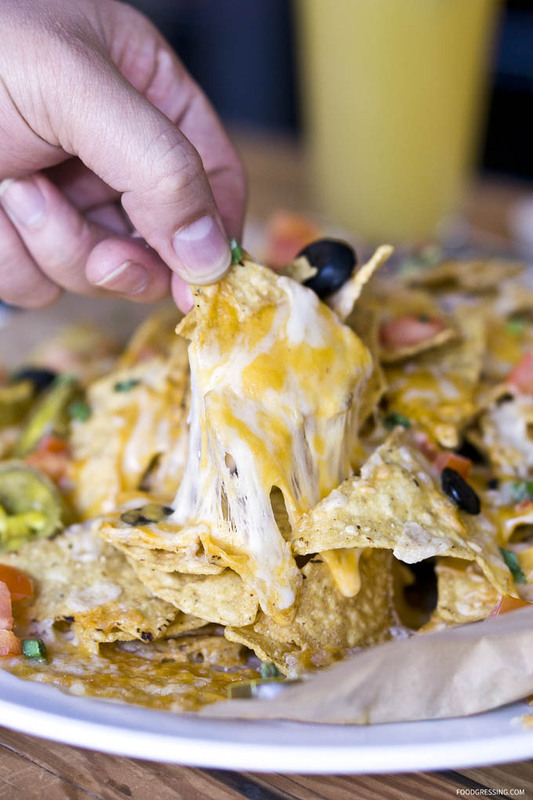 Side dips and additional toppings are available. As for mains, you’ll find salads, sandwiches, Ocean Wise seafood, steak, pasta and more. 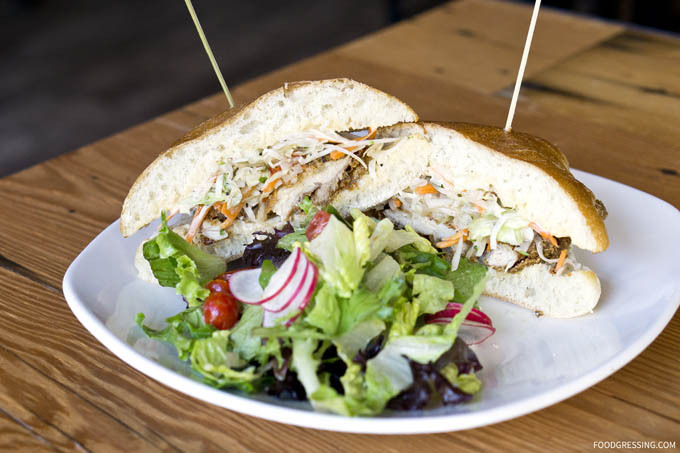 Their handheld items range from The Basic B to some Asian-fusion options like Crispy Chicken Banh Mi and Waffleburg. They use 100% Canadian certified meat. 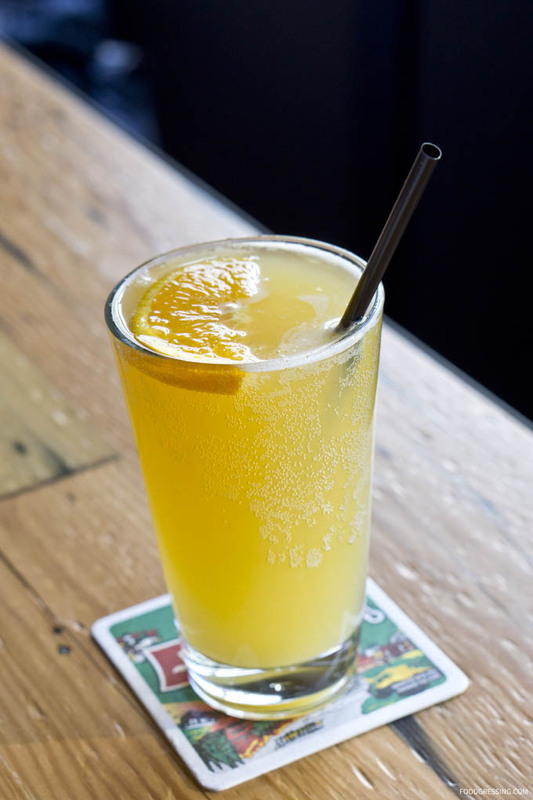 To start, there was the Beergria, a beer cocktail made with Kronenbourg Blanc, peach ciroc, orange juice and lemon juice. It was the first time that I had a beer cocktail and I quite enjoyed it. The taste was more on the beer side than cocktail so kind of citrusy beer. 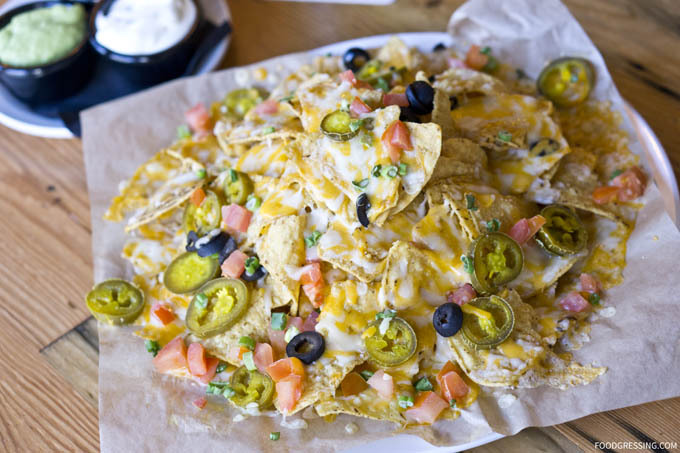 The nachos were a cheesy hot mess of three cheeses, black olives, picked jalapeno, green onion, tomato, sour cream, pico de gallo and guacamole. 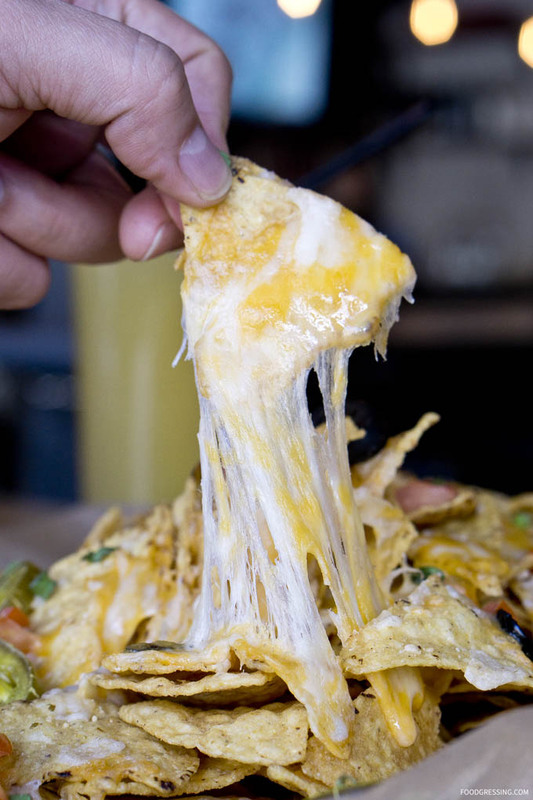 I thought the portions of other ingredients versus chips and cheese were good. Most of the bites were chips, cheese plus a little bit of something else rather than just chips and cheese. The guacamole, in particular, was excellent: rich, creamy, fresh, tangy and nicely flavorful. The Waffleburg is a new addition to their menu and it stood out to me. I missed the now-closed Miura which was famous for their waffle burgers. 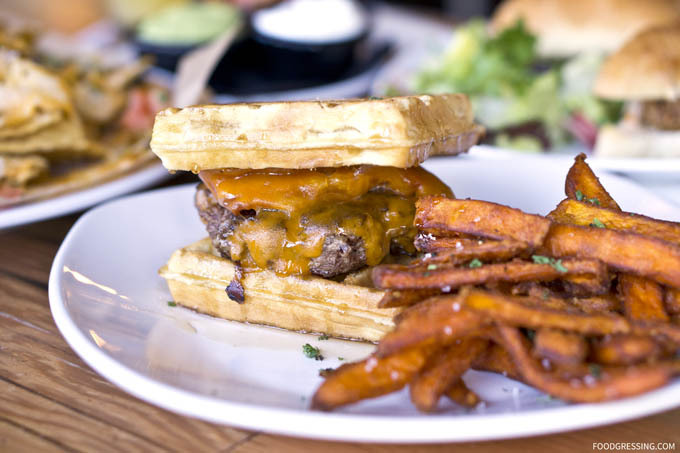 The waffle burger had a 6 oz waffle patty and bacon with melted cheese overtop and then sandwiched between two waffle buns. On the side, bourbon maple syrup for some extra drizzle. I found it easier to eat by cutting up the waffle and patty into smaller pieces and eating them together rather than taking one big bite. The waffle bun was light and fluffy but the patty could be more moist and juicy. One of the surprises to the meal were just how good their yam fries were just. I don’t find myself usually raving about yam fries but the ones at The Eastwood were wonderfully crispy, well-seasoned and super addictive. I would recommend the upgrade for them. 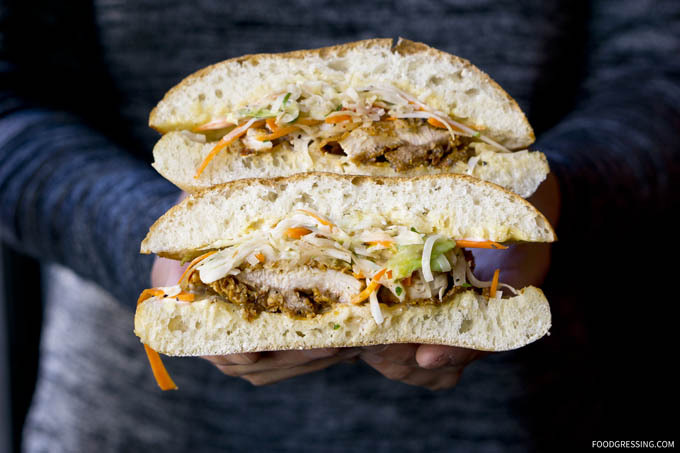 Another unique menu offering at the Eastwood was the Crispy Chicken Banh Mi – a handheld with a sort of twist. Rather than a traditional French Baguette, this banh mi uses ciabatta. The ciabatta had a crispy crust and then soft and airy on the inside. The crispy chicken was pleasantly “crispy” and had a nice additional Asian flavours from the miso dijon aioli and daikon slaw. My only feedback would be perhaps to reduce the thickness of the ciabatta. It’s just a lot of bread proportionately speaking in my opinion. 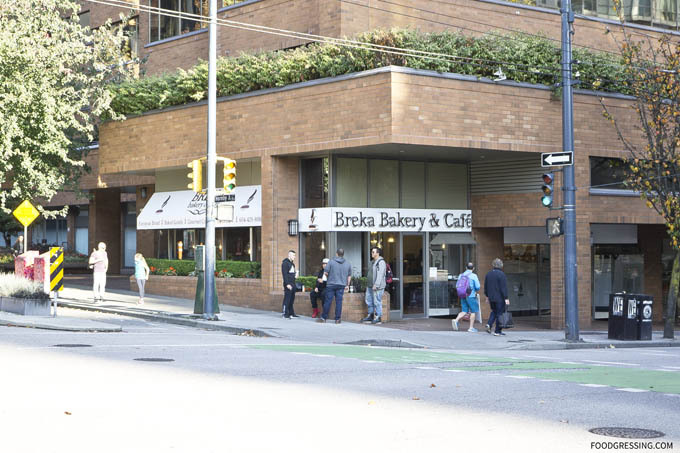 Breka Bakery & Cafe is one of my favourite bakeries in Vancouver. They have three locations in Vancouver (Fraser, Bute and Davie) and the Davie one is my regular go-to bakery. 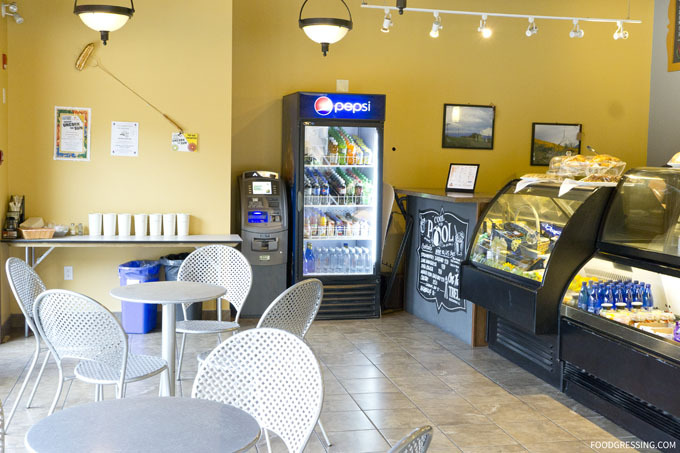 One of the great things about Breka is that they are open 24 hours which makes it a convenient place to study, grab coffee or even late night bites. 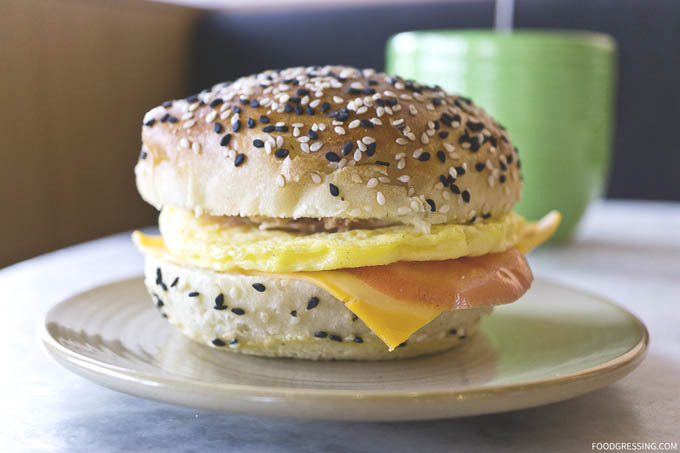 Breka has an amazing selection of baked goods, cakes, and gourmet sandwiches. 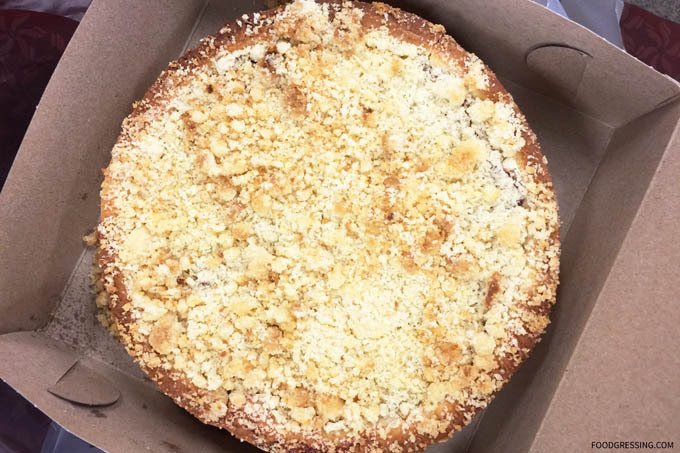 Their pastry section is particularly mouthwatering with items ranging from cookies, donuts, tortes, strudels to slices of cake. Breka saves me the trouble of needing to preorder a cake or pie for a party because they have them ready-made on display. 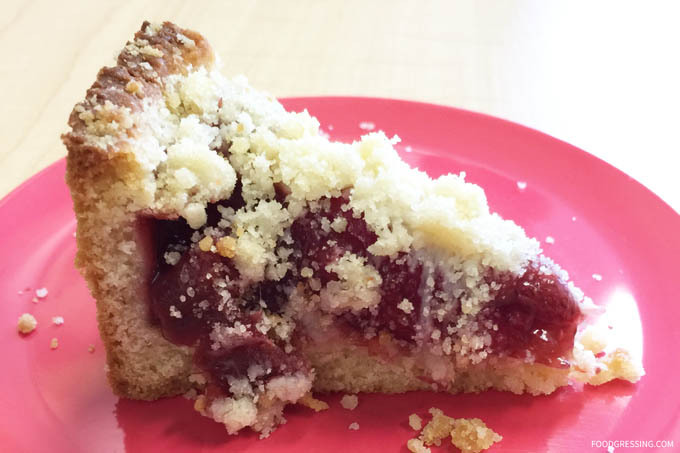 On a few occasions, I have picked up their blueberry and raspberry tortes ($12.50) to bring to workplace potlucks. They’re hits with my coworkers and they get eaten up rather quickly. 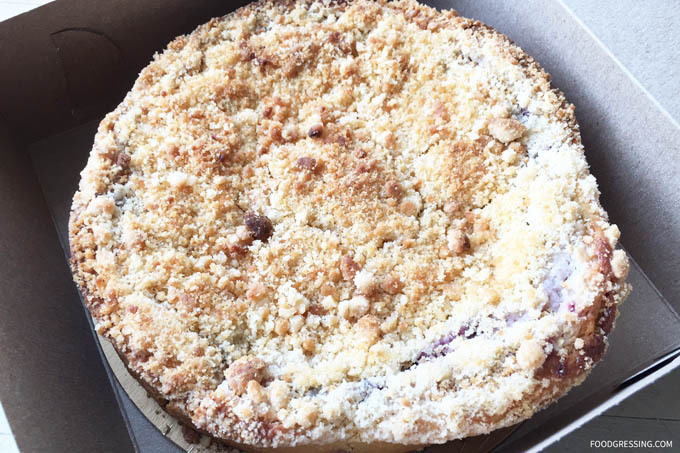 I love the crumble topping and sweet blueberry and raspberry filling. Their cookies are oh-so-good and not overly decadent. The cookies are priced $1 each and have made great treats at the office. I have tried the birdsnest, Belgian chocolate brownie, chocolate chip cookie and white chocolate pecan cookie. My favourite is the birdsnest because of the jam filling in the middle. I have also enjoyed a chocolate dipped almond horn ($4.25) which had a moist and chewy interior under a crunchy almond coating. Bonus points for some simple latte art ($3.25). 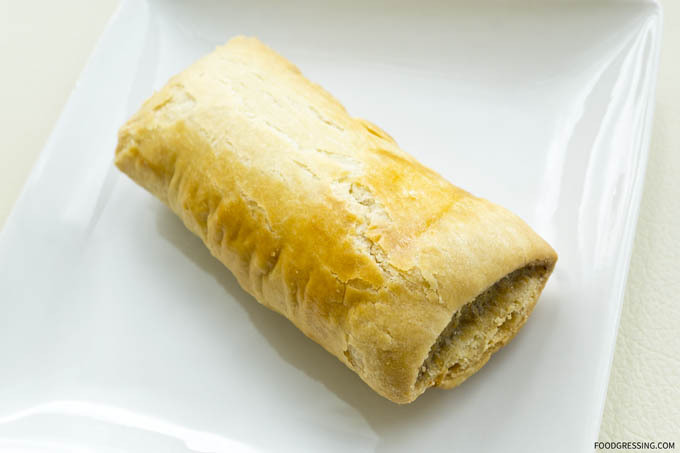 As for savouries, their sausage rolls ($2.25) make a great to-go treat. I love the flaky, golden pastry and the pork filling is delicious. A Bread Affair on Granville Island differs from most bakeries in town because they are BC’s first certified organic bakery. 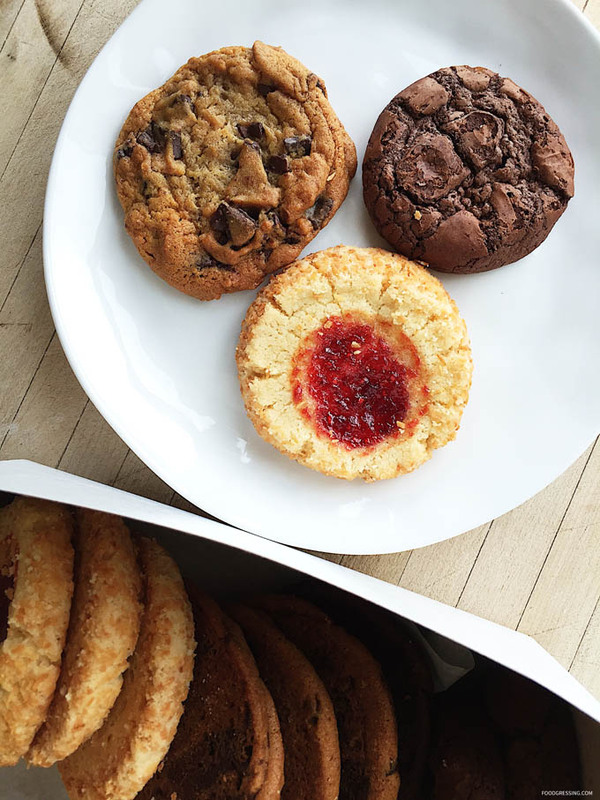 Their baked goods are made with ingredients that are free of GMOs, chemicals, and pesticides involved with the growing of the ingredients. Furthermore, there are no additives, stabilizers or preservatives in their products. 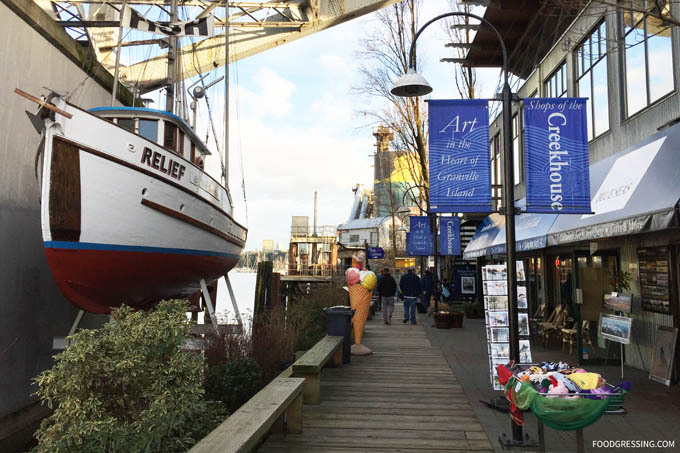 On Granville Island, they operate a stand-alone building across the public market building. You’ll find street performers entertaining crowds just outside their shop along with some benches where you can sit down and enjoy their treats. 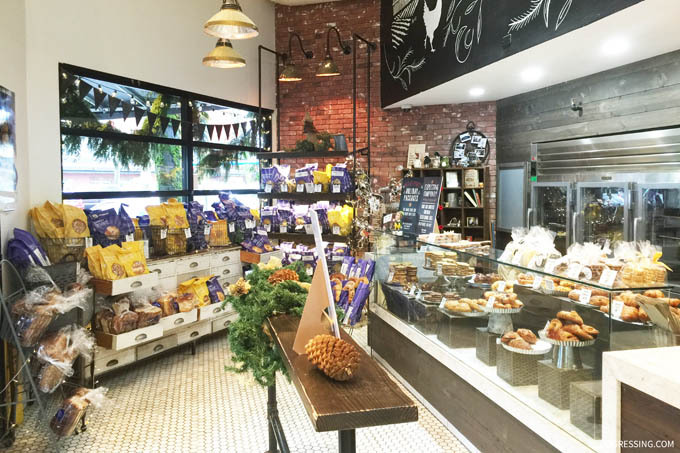 A Bread Affair sells organic artisan breads, cookies, pastries and sandwiches. It seems more like a grab-and-go sort of place as there is no area for eating-in inside the shop. 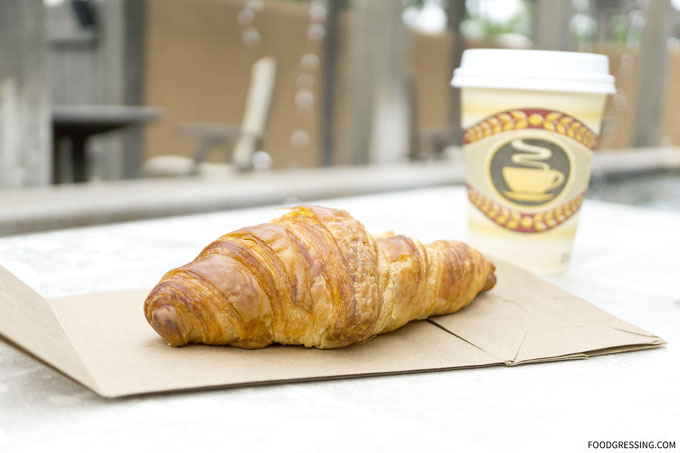 I had heard that their croissants are some of the best in the city and decided to try them out. 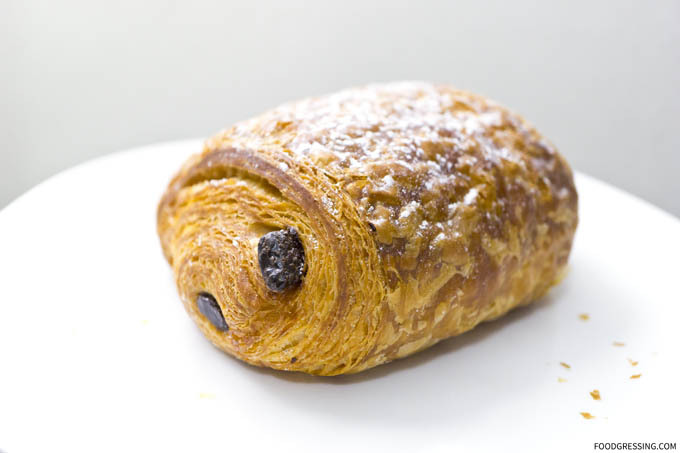 In terms of pricing, they are a bit more expensive than other bakeries in town that are famous for croissants like Thomas Haas and Beaucoup. 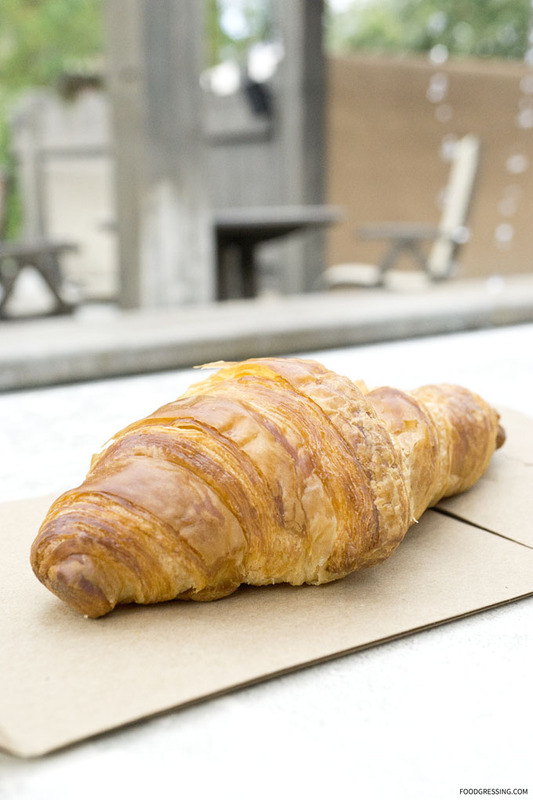 At A Bread Affair, a plain croissant is $4 compared to $3 elsewhere. 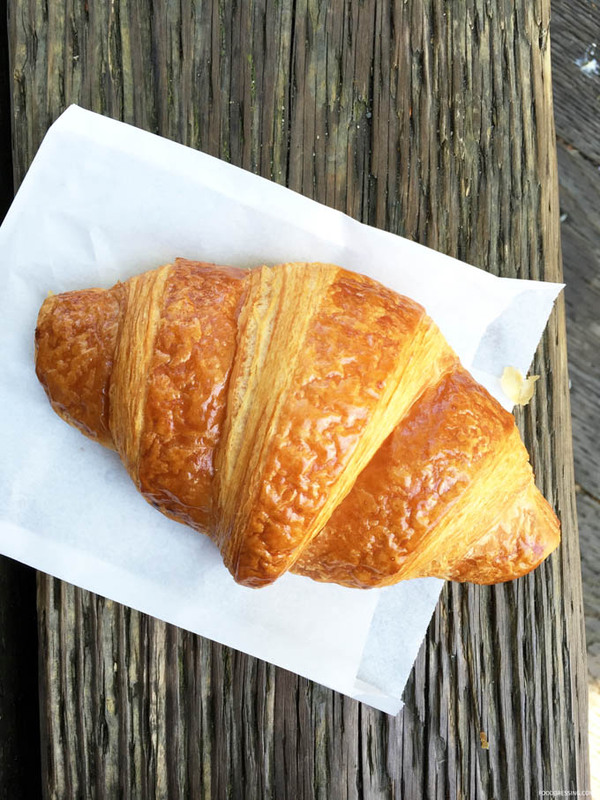 The plain croissant I tried was excellent – buttery, flaky, and golden brown. I liked how the croissants did not leave much grease on your hands. And when you first bite into it, there is that wonderful crunch sound. On another visit, I tried their pain au chocolate which was also very good. I thought there was a reasonable amount of chocolate embedded within the layers. Granville Island Gelato & Coffee is sort of a hidden cafe on the island. 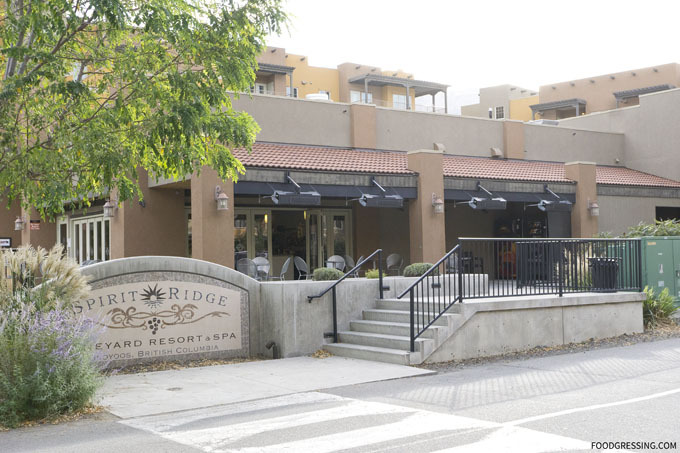 It is located along the boardwalk behind Sandbar restaurant and the Arts Club. 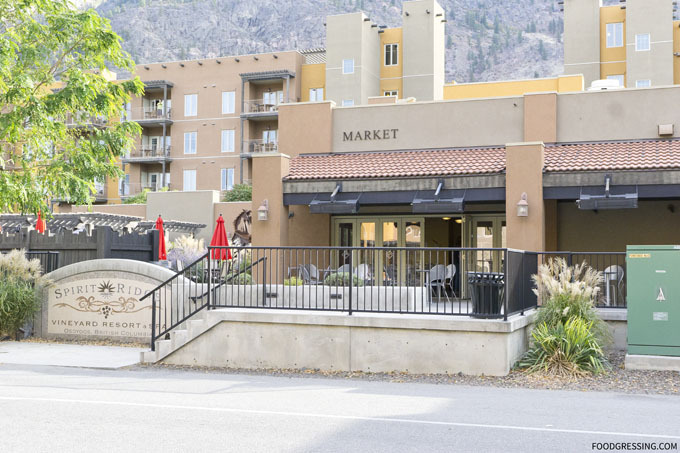 This place serves 18 flavours of homemade gelato and sorbetto, fair trade and organic coffee along with other cafe staples like soups, paninis, and baked goods. 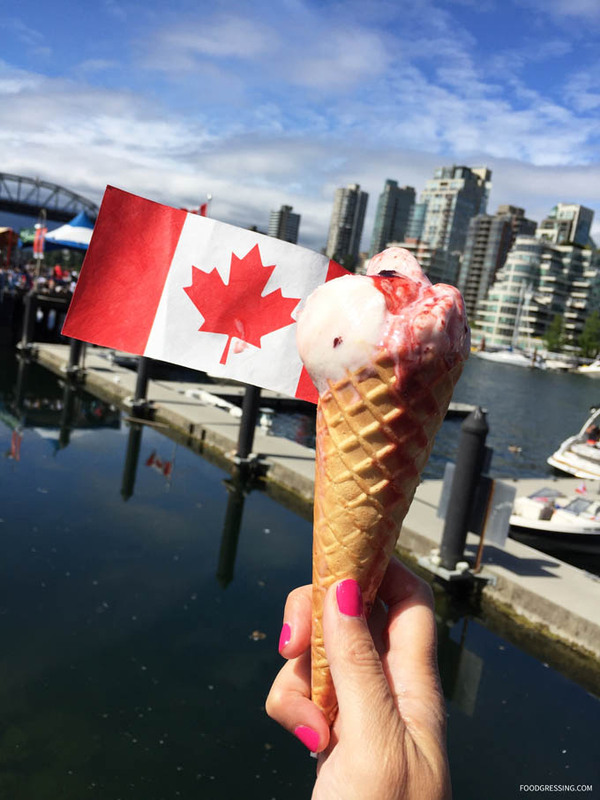 Last summer, my family and I celebrated Canada Day on Granville Island. 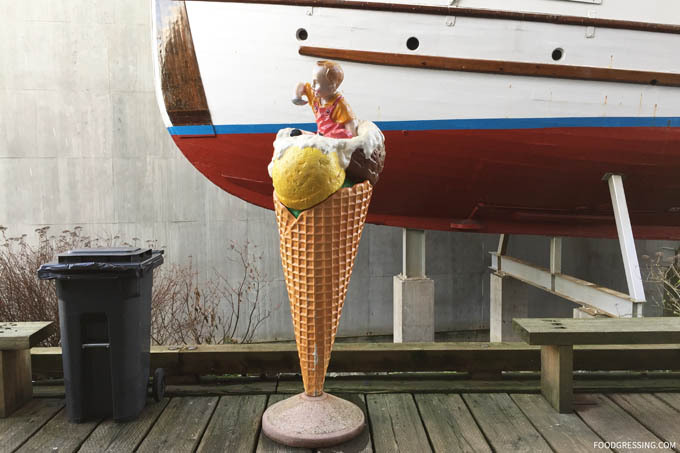 And since it was a nice, warm, sunny day, I decided to get my son a gelato cone from Granville Island Gelato & Coffee. There was a bit of line as many people were seeking to cool off from the heat. The single waffle cone cost close to $5 ($4.25 for the single scoop and $0.60 extra for the waffle cone). Even though it was busy, the girl at the counter still allowed you to sample a few flavours. I went with the strawberry flavour which had a nice, smooth, creamy texture though nothing to write home about. At nearly $5 for a single scoop, the amount of gelato given wasn’t that impressive. 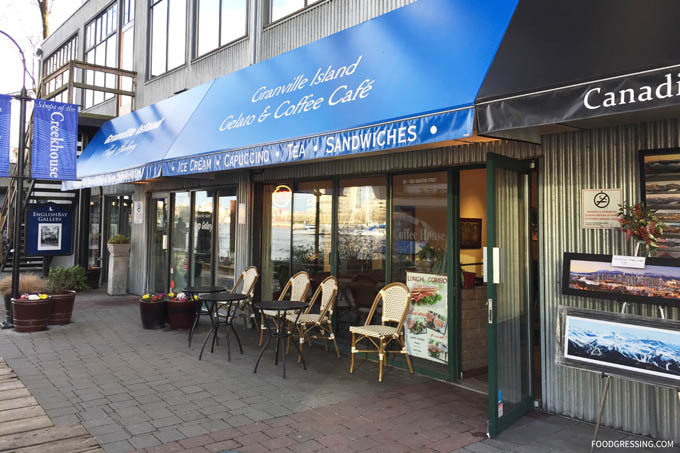 I guess you would say that it is fairly priced for being on Granville Island. The Only Cafe in Kitsilano came to my attention when I saw their Groupon deal for Royal Belgian Coffee Service. 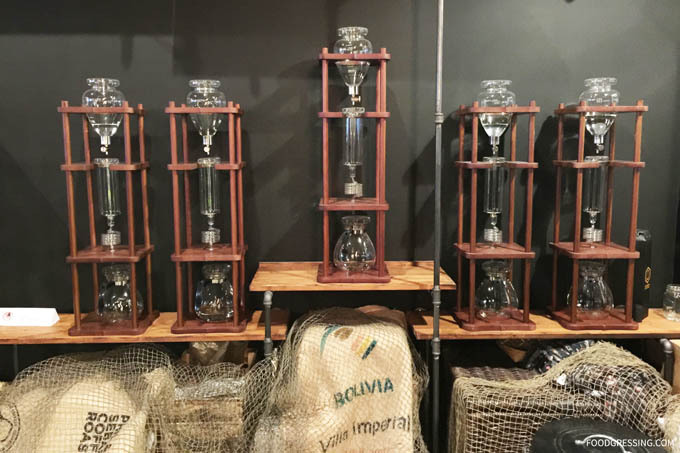 I must admit that I’m not a coffee snob (though I love a good cup of joe) and decided it would be interesting to learn more about this type of coffee brewing. It was only recently that I found out just how many ways to store your coffee there actually are, and I was fascinated to learn. The deal seemed to garner much interest as it is currently sold out; it was priced at $18 and included desserts for two. 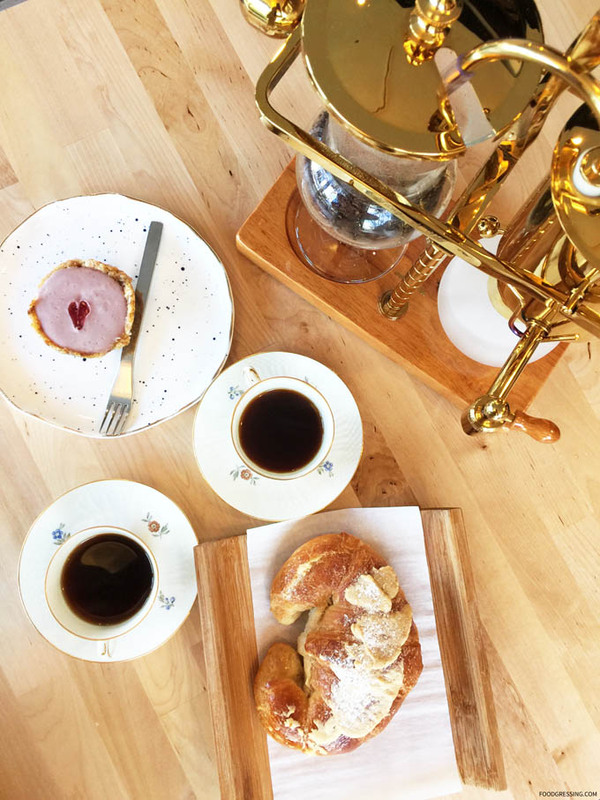 A few weeks ago, my husband and I ventured to The Only Cafe to see what Royal Belgian Coffee brewing was about. But first a bit of background on the Only Cafe. 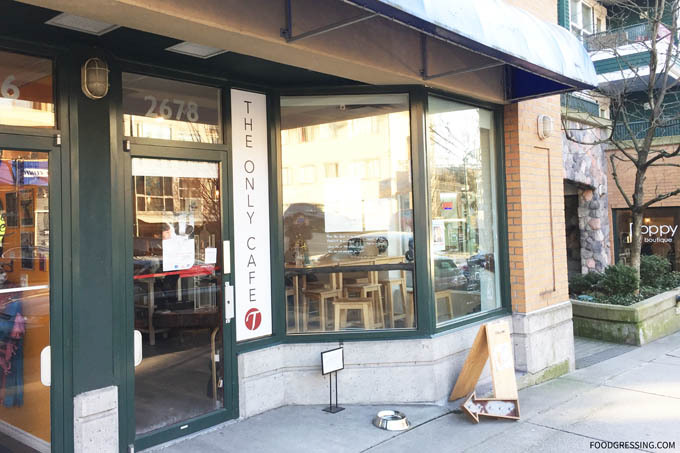 This newish, independently-owned cafe has been open almost a year now and is located in Kitsilano (near West Broadway and MacDonald). The coffee they serve is direct trade travelling directly from the farmer to the roaster and includes beans from Columbia, Burundi and Yemen. The interior is a comfortable setting with soft, white walls, natural wood details, and small floral accents. 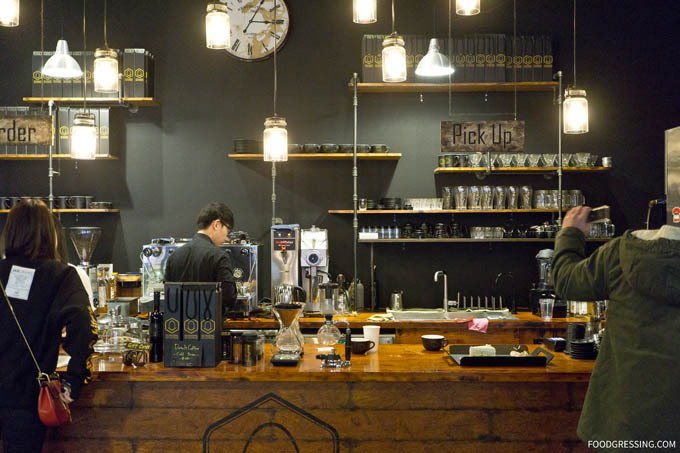 And around the counter, a display of various coffee-making contraptions which highlight that The Only Cafe is a serious place for an elevated coffee experience. During my visit, I saw many customers on their laptops working. This seemed like a good place to hide and get work done over great coffee. One of the more remarkable aspects of the Only Cafe is that they allow outside food. Furthermore, they are so environmentally friendly that you can bring your own cup. Regardless if it is a tumbler or a paper cup from somewhere else, you will receive a cup discount. Reservations were required for the Royal Belgian Coffee service. When I phoned it, they weren’t very busy so we went right away to the cafe. For coffee, we went with Yemen’s rarified coffee. Up until that point, I had no idea that Yemen made coffee. It was then that I learned that it was illegal to grow and sell coffee beans in Yemen before. Now with government powers relaxing, the country has started to let the world know of their coffee. The yemen coffee profile features plumy and floral aroma to start with a very sweet body and long finish. Maybe sites like the Neptune Coffee blog would be able to teach you how to make these sorts of drinks at home I am sure! Really enjoyed the Royal Belgian Coffee service @theonlycafevancouver ?? in Kitsilano. 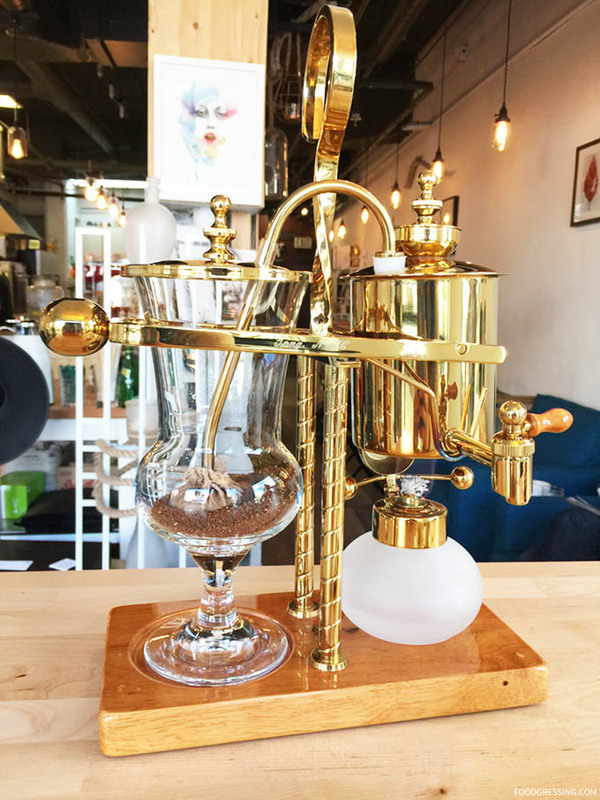 This involves brewing coffee using two chambers where vapor pressure and vacuum produce coffee. With the Royal Belgian Coffee experience, you can enjoy three brews each with a different taste. This happens at your own table and you can watch the process. . We went with Yemen’s rarified coffee. Up until that point, I had no idea that Yemen made coffee. Did you know that it was illegal to grow and sell coffee beans in Yemen before? Now with government powers relaxing, the country has started to let the world know about their coffee. The yemen coffee profile features plumy and floral aroma to start with a very sweet body and long finish. With the Royal Belgian Coffee experience, you can enjoy three brews each with a different taste. This actually involved quite a bit of tableside service from the barista owner who explained the flavour profiles each time. Quite a friendly, knowledgeable guy who was patient with non-coffee experts such as myself. The first brew was very strong; the second was smooth and slightly sweet; and the third tasted closer to an Earl Grey tea and was the sweetest. My favourite was the second brew. For treats, we went with an almond croissant and a vegan raspberry cheesecake. 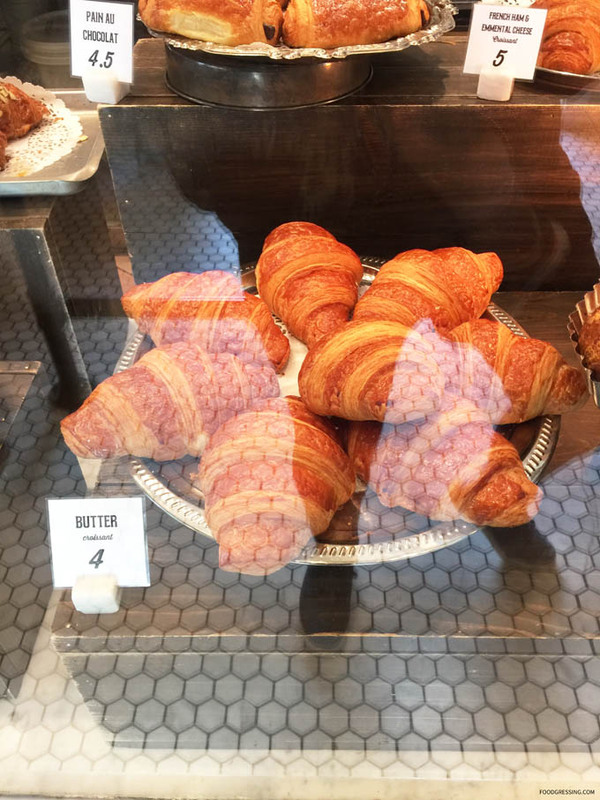 Speaking with the barista owner, I learned that the almond croissant is made with a plain croissant by Faubourg with the addition of their homemade almond spread. The reason is that they prefered their own almond spread with the croissant. I thought the intentions were good, but presentation-wise it did not appeal to me so much. I didn’t quite like that they had precut the almond croissant in order to put in the almond spread. The vegan raspberry cheesecake, on the other hand was very delicious with a creamy, nutty filling with a nice amount of sweetness. I couldn’t quite taste the raspberry but it definitely tasted fruity. 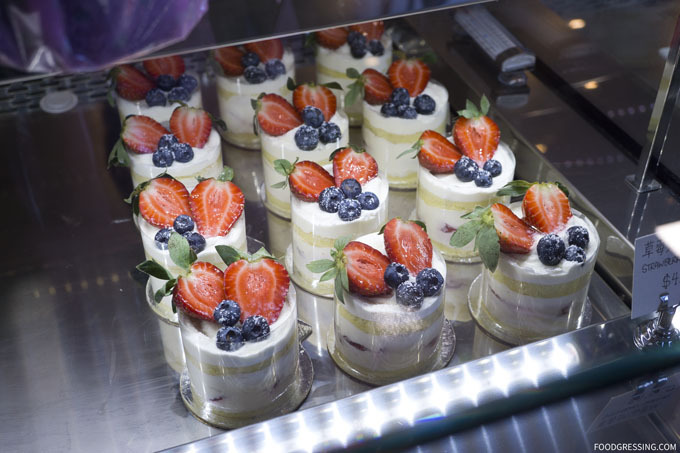 If you’re a dessert lover, L’otus Cake Boutique is the kind of place that is worth the drive. 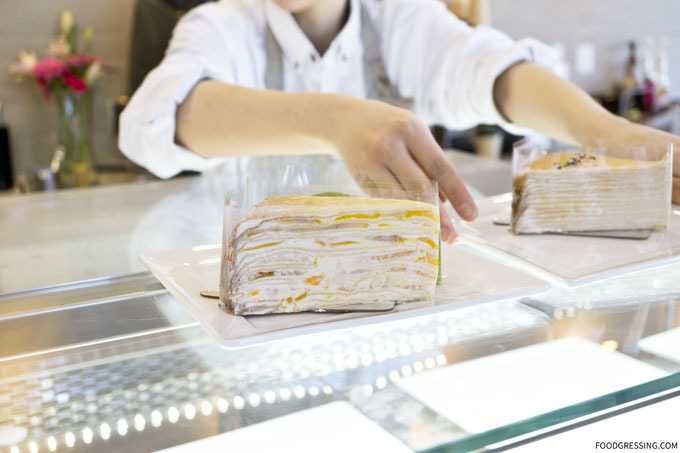 It’s a new dessert cafe which opened in Richmond a few weeks ago and they offer different flavoured mille crêpes cakes – a classic French cake with alternating layers of crêpe and cream. My friend, Alice, is a mille crêpe connoisseur having made crêpes cakes herself (see video here). 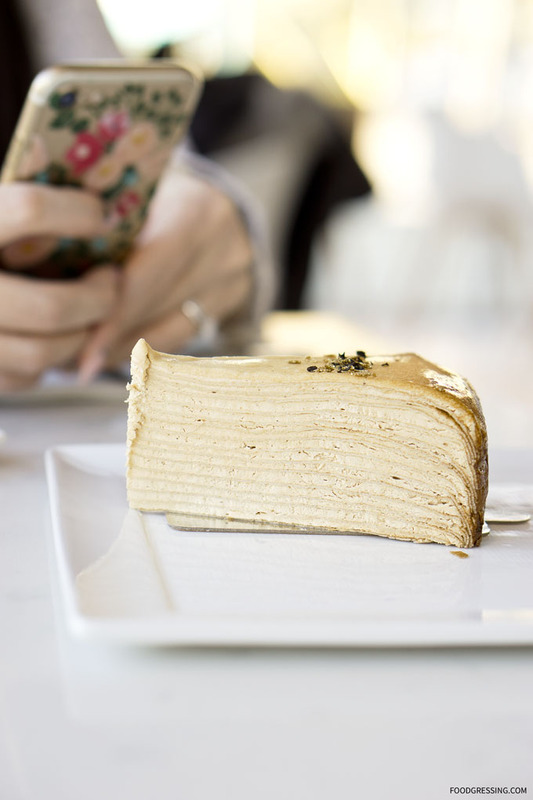 This past week, we visited L’otus Cake Boutique to see just how good their crêpes cakes are. 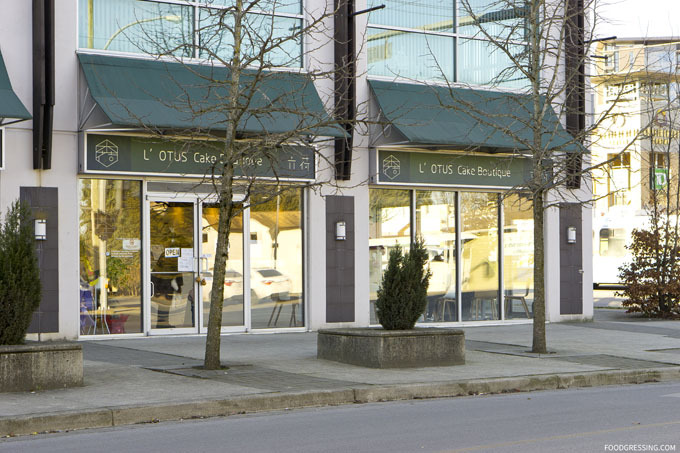 Located at 8580 Cambie Road across Continental Centre, L’otus Cake Boutique is a small, modern cafe that seats about 20 people. The space is bright and clean with white and grey marble details. The mille crêpes cakes are freshly made in-house throughout the day and I noticed they were coming out of the kitchen periodically. The display case has lots of tantalizing goodies. 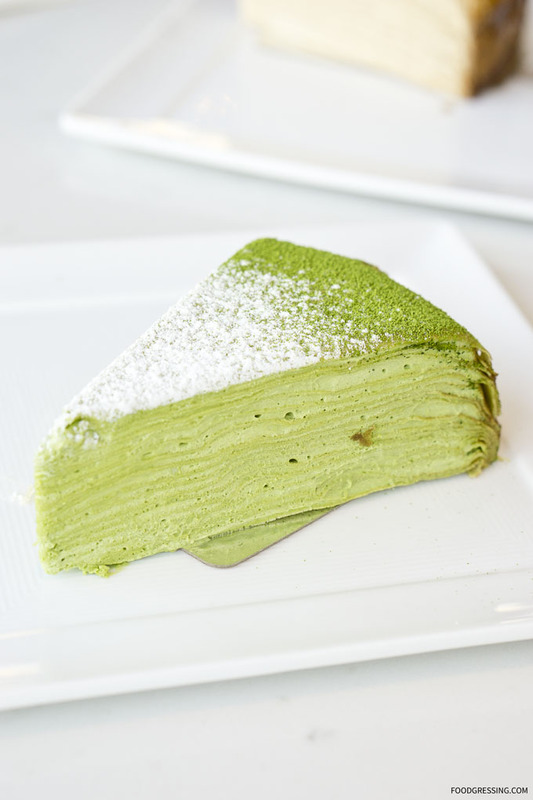 The mille crêpes cake flavours that were available at the time of my visit were matcha, Earl Grey and mango. The matcha and Earl Grey are $8.00 a slice while the mango one is $13.80! 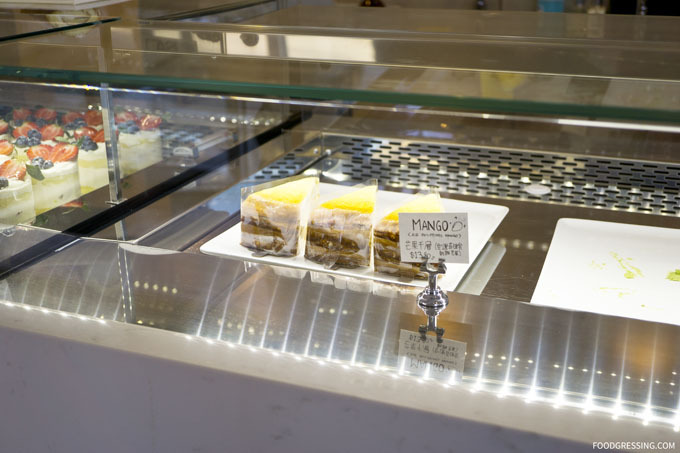 There is a premium charge for the mango mille crêpe cake because the mangos are imported from the Philippines. 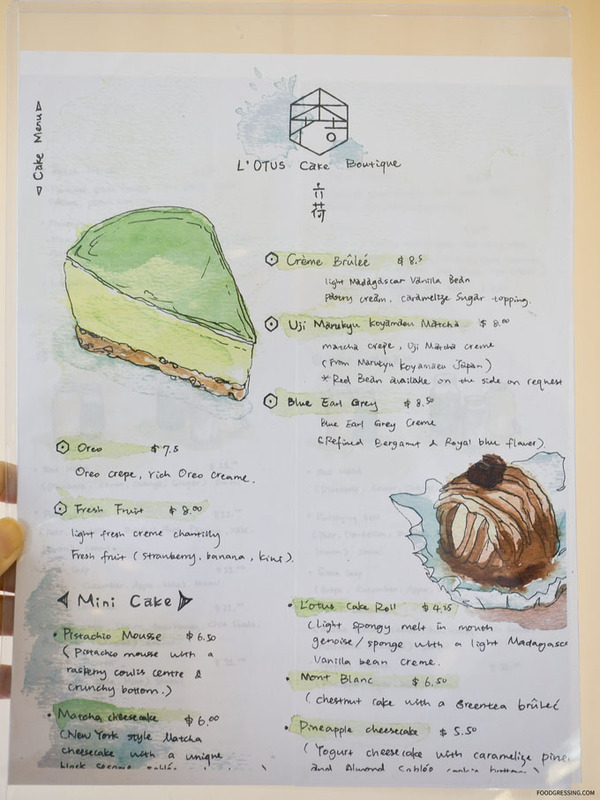 On their menu are other mousse cakes, Mont blanc and cheesecakes (matcha and pineapple) but these were not available at the time. The girl at the counter said they only have whatever is on display. 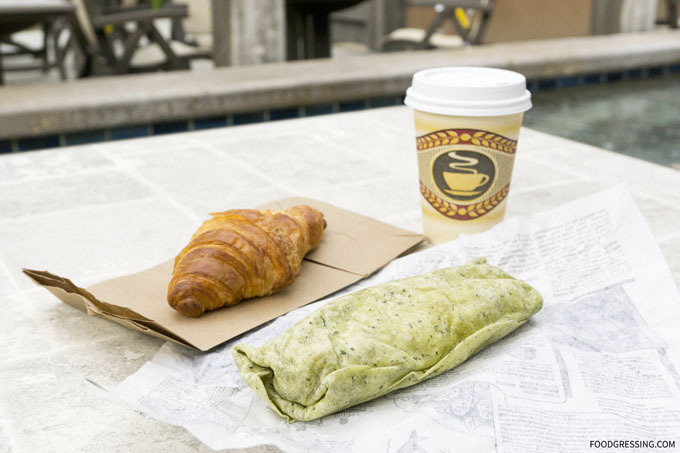 L’otus also offers espresso-based beverages and teas to go along with your dessert. The mango mille crêpes cakes are certainly a premium cake! 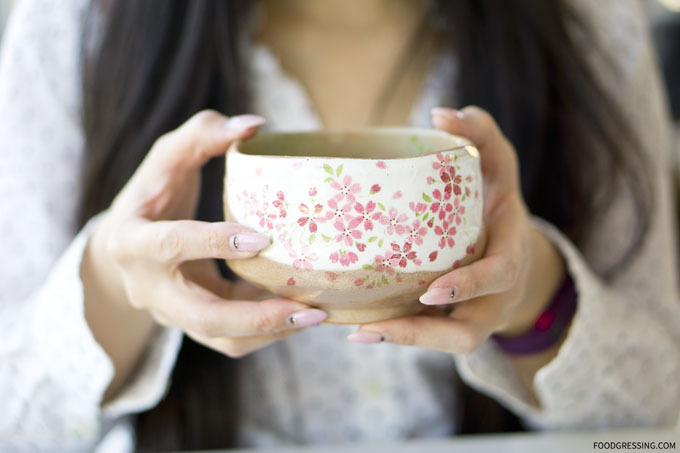 Alice had a matcha latte ($5.25) which came in the most pretty sakura-inspired matcha chawan. 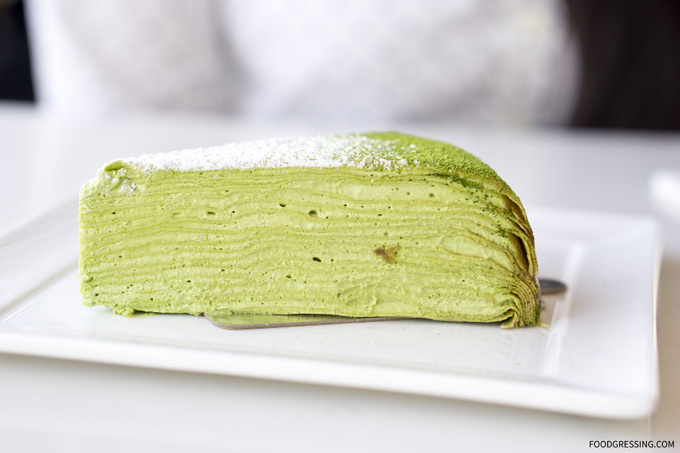 We shared matcha and Earl Grey mille crêpes cakes. Both cakes were oh-so-good and were moist, light, creamy and flavourful. 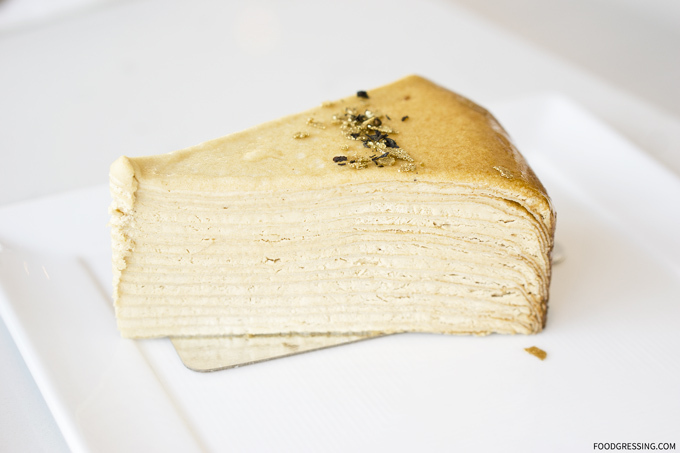 The mille crêpes cakes were more cream than crepe as the crepe layers were thin while the cream layers were thicker. My favourite was the Earl Grey mille crêpes cake because it had such a delicious Earl Grey flavour. I also found the cake to be quite fragrant from the bergamot. Also delicious was the Matcha which had a decent green tea flavour. If you ever visit Crystal Mall, you might have noticed a sweet smell in the air just outside the market area. 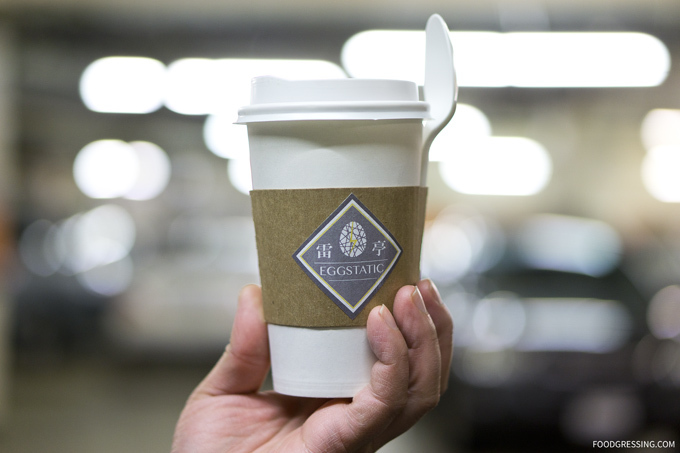 It’s coming from Cafe Eggstatic, a small eatery serving bubble tea and bubble waffles. 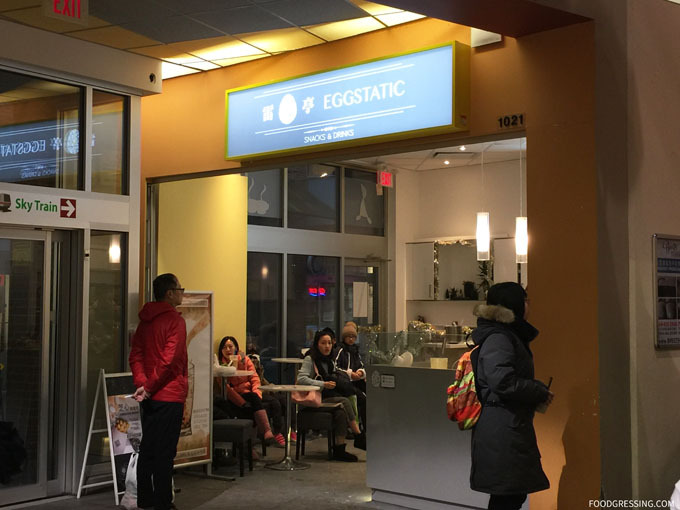 While Cafe Eggstatic isn’t the only place serving bubble drinks and snacks in Crystal Mall, they are the only one located on the ground level. And because they are near an entrance, they tend to be noticed right away. On a recent shopping trip to Crystal Mall, I decided to try out some of their items. 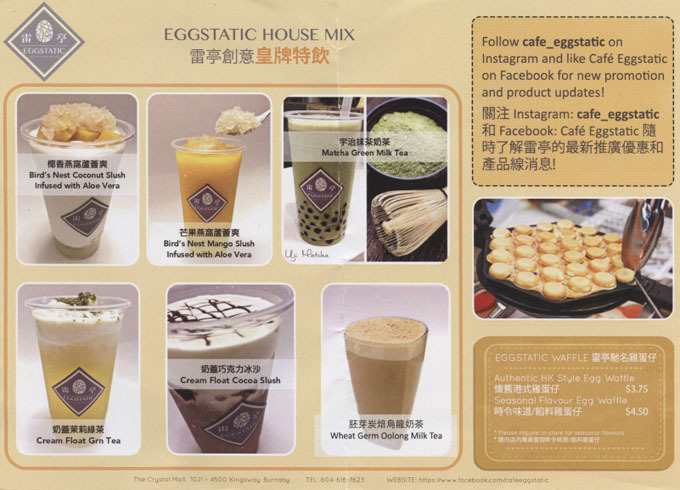 Cafe Eggstatic offers a variety of beverages including milk tea, fruit tea, slushes, smoothies, cream floats and more. Prices seem to be on par with other bubble tea houses in the city ($3.50 – $5). One of their more unique drinks involve using bird’s nest, a delicacy in Chinese cuisine. Cafe Eggtastic incorporates it into a coconut or mango slush. 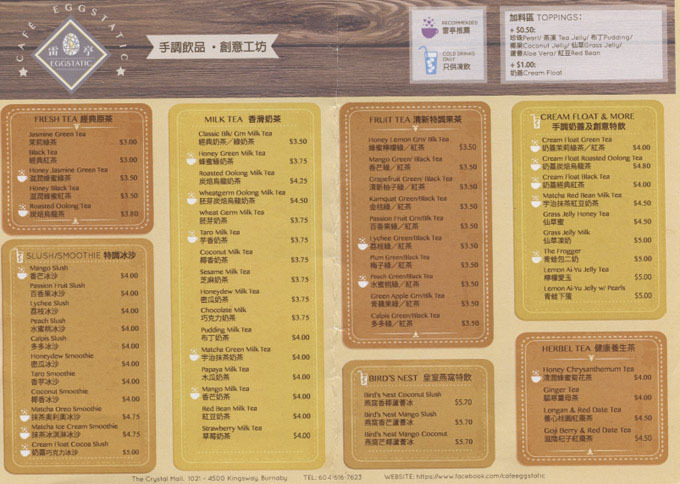 Below are images I scanned of their menu. 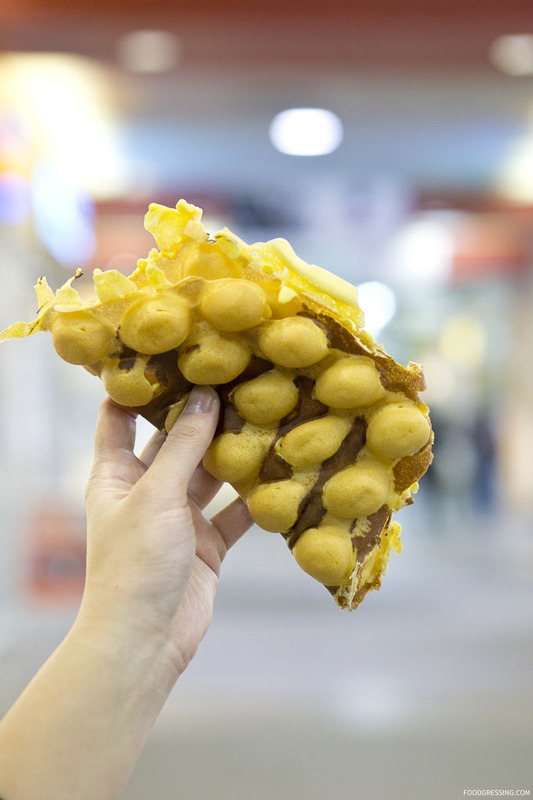 For snacks, they offer bubble waffles in classic ($3.50) or season flavours ($4.50). 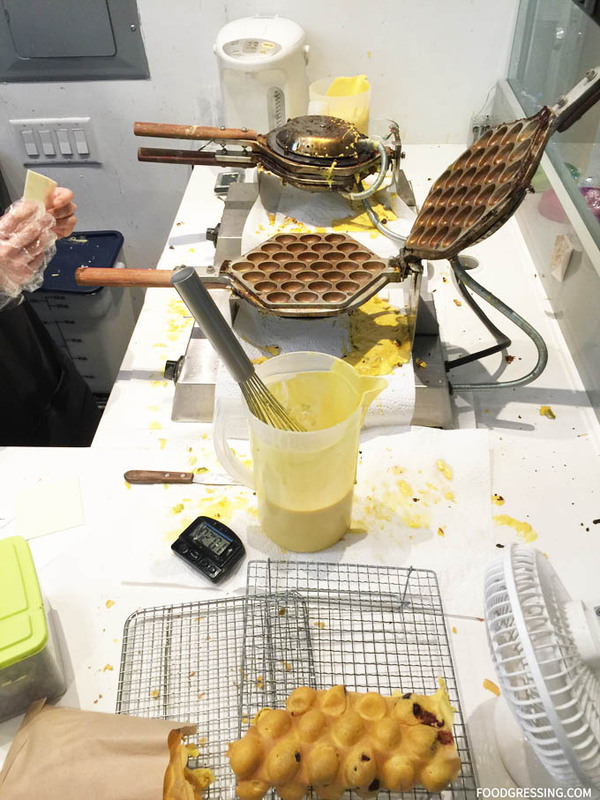 Bubble waffles seem to be a popular item offered by Cafe Eggstatic. The area where they make them is viewable and is very active. 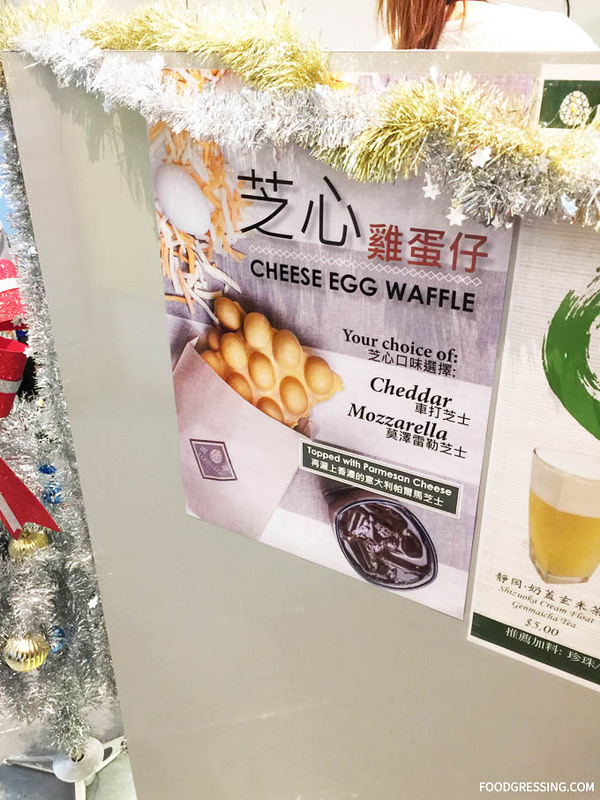 On this particular visit, I noticed their seasonal flavour was a cheese egg waffle (choice of cheddar or mozzarella) topped with Parmesan cheese. Let’s start off the bubble waffles. They were just OK and I’ve had better elsewhere (Bubble Waffle Cafe, Bubble Queen). It wasn’t super crispy on the outside and the dough was a bit tougher and chewier than I would like. The waffles were average at best. 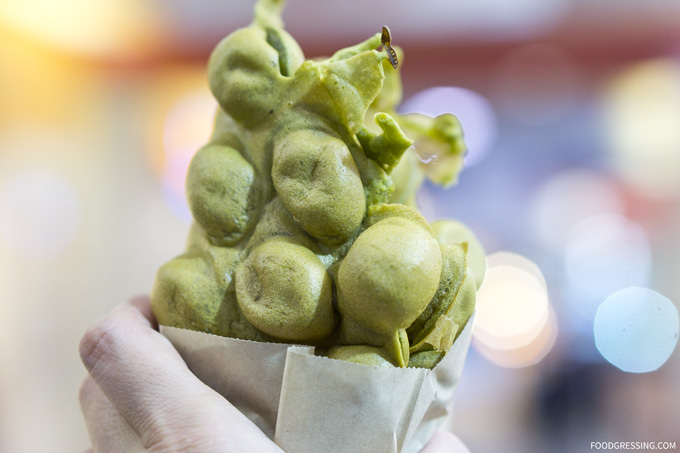 The matcha bubble waffle had reasonable matcha flavour. There was disappointment regarding the cheese waffle. On their sign, it said that it would be topped with Parmesan. However, when I received it, there were no Parmesan toppings. I asked the server about this and she mentioned that the Parmesan topping would have been included as a filling *if I made the request ahead of time* I mean, if your sign says that it is a topping (as seen on the photo above), the customer shouldn’t need to have to make sure that it is included. In a way, I felt like it was a scam to get you to buy the cheese waffle with the thought of having extra Parmesan. It just wasn’t a very good way of treating customers. The taro milk tea was too sugary and masked the taro flavour. 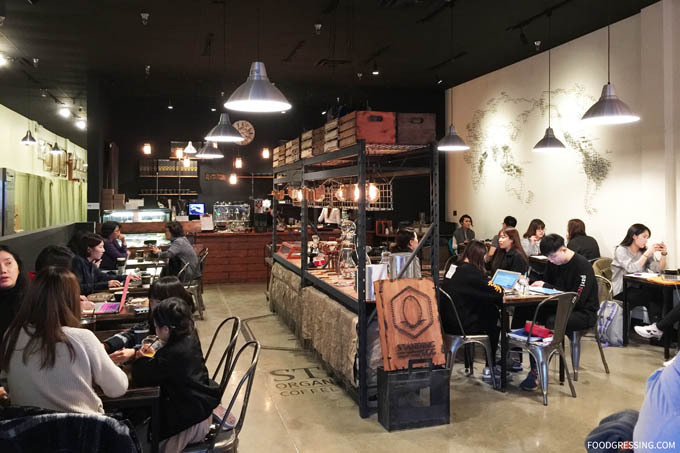 Good Earth Coffeehouse Vancouver + GIVEAWAY! Looking for a new place to sit back, unwind and enjoy a good cup of joe? 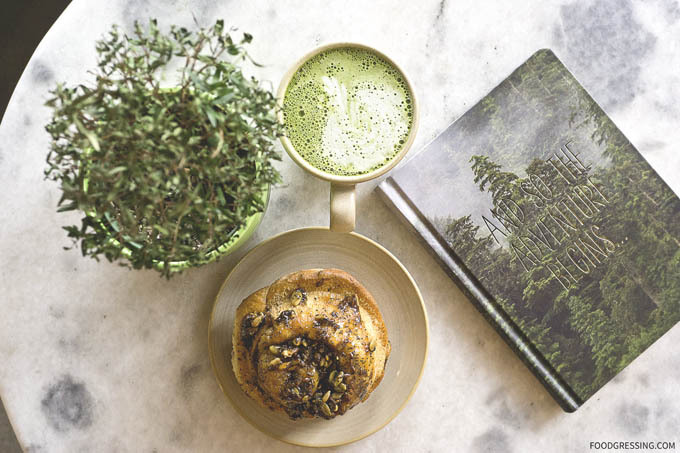 You might just want to check out Good Earth Coffeehouse‘s newest locations in Vancouver. 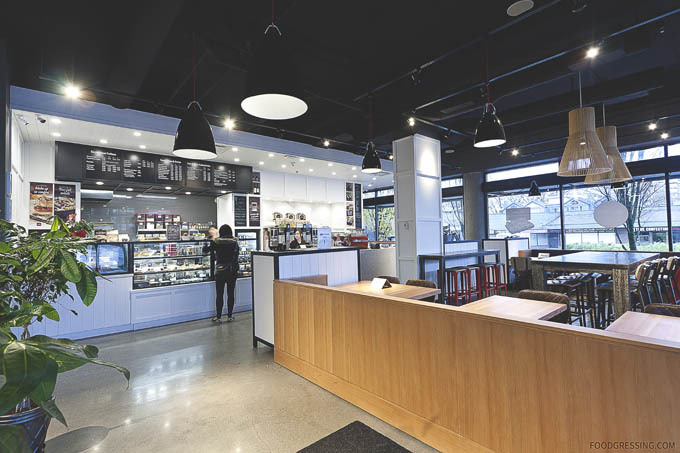 The popular Alberta-based coffee franchise recently celebrated grand openings on Alma Street (Point Grey) and at Capilano University (North Vancouver). I had the pleasure of visiting the Alma location to try out their food and beverage offerings. 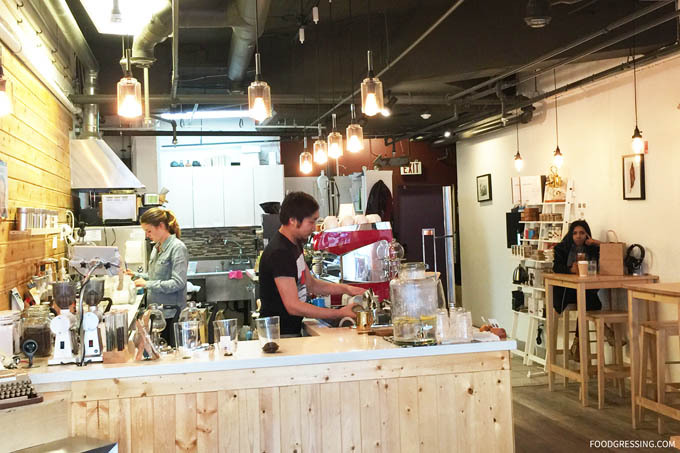 Good Earth Coffeehouse on Alma has an inviting, modern and spacious feel. There is a nice variety of seating arrangements including a cozy lounge area, a counter by the window, a communal table, and various dining tables. With a tall ceiling and floor-to-ceiling windows, the space feels cozy and comfortable for relaxing, studying or getting together with friends. 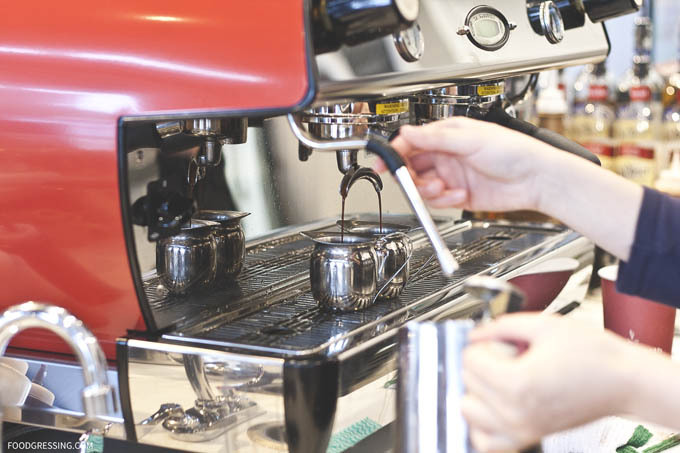 On the menu are the usual espresso-based drinks including macchiato, latte, mocha, cappuccino, and espresso. Good Earth is committed to being socially and environmentally-conscious; they work with farmers who promote environmental sustainability, and establishes direct trade practices to help improve communities where coffee is grown. Many of their coffees are Rainforest Alliance Certified which means that they meet comprehensive social and environmental standards. Cold, handcrafted drink options range from craft cold brew coffee, smoothies and more. 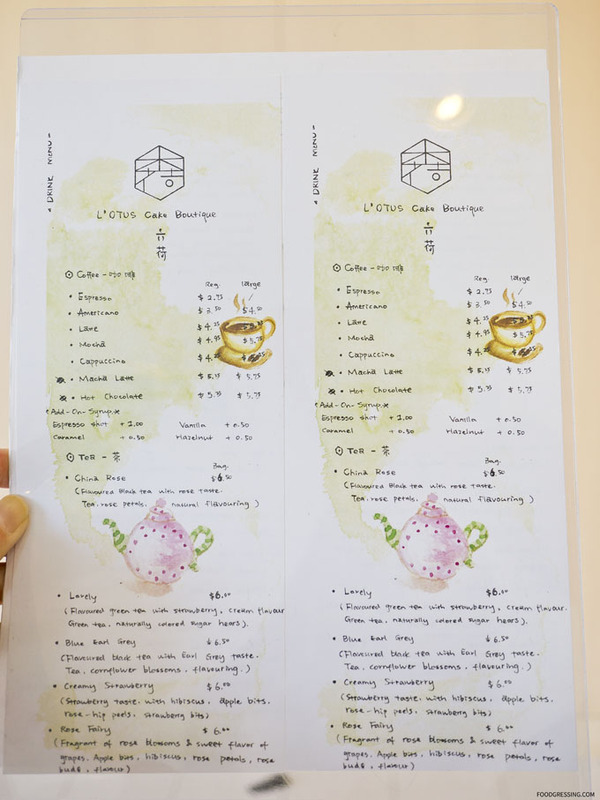 The tea menu also features teas from exotic origins and traditions including spicy Chai, rich Matcha and African Rooibos. 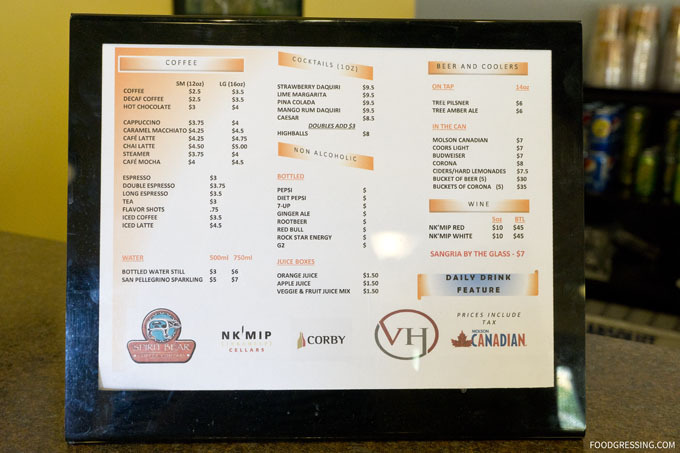 Aside from caffeinated beverages, Good Earth Coffeehouse also serves beer and wine. I was certainly impressed with the number of food options at Good Earth; there seems to be more choices than your typical coffeehouse. 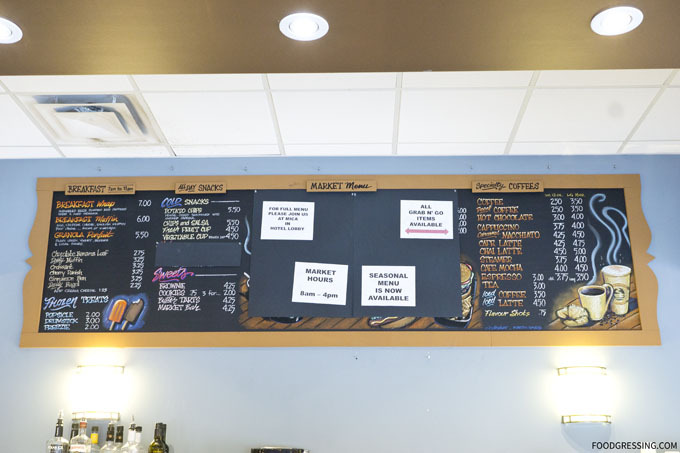 You’ll find breakfast items, fresh baked goods, soups, salads, sandwiches, panini, flatbreads and more. Breakfast is the important meal of the day and Good Earth has some solid options. I tried the very wholesome breakfast sandwich with whole eggs, cheddar cheese, bacon and a tomato slice. Forget instant oatmeal (eek!) because Good Earth serves steel-cut oatmeal. 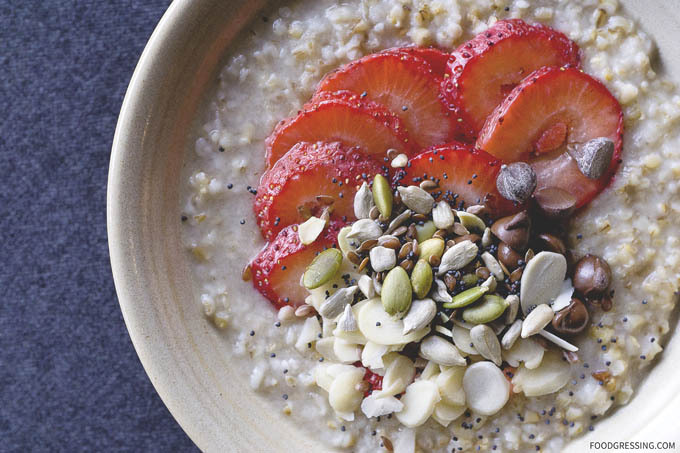 You can even customize your oatmeal with choice of three toppings like fruit and nuts. 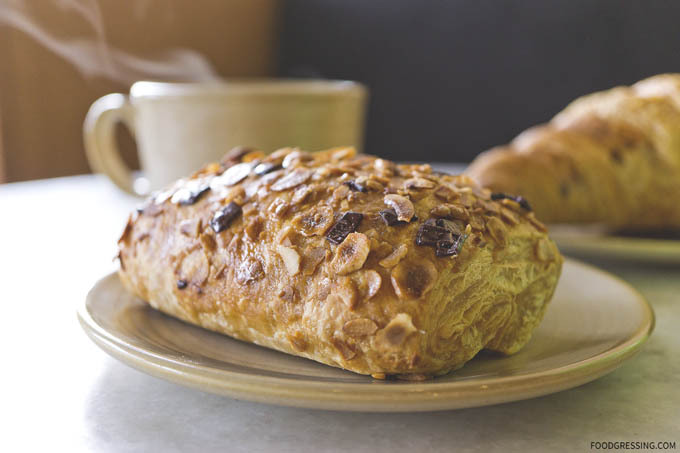 A good cup of coffee deserves an amazing pastry. 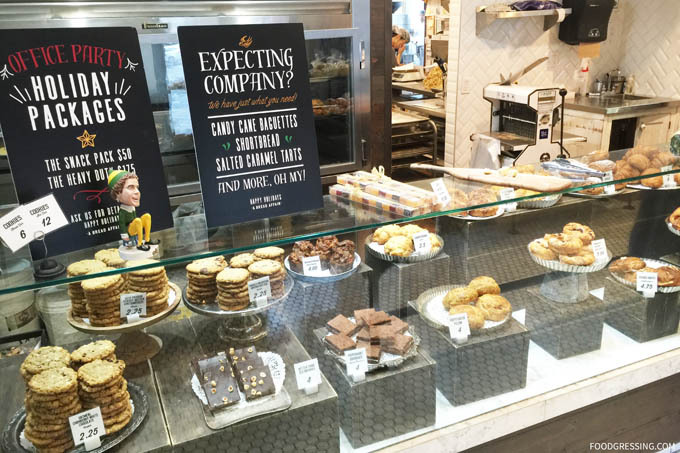 Good Earth prepares baked goods from scratch and delivered fresh from the oven multiple times per day. 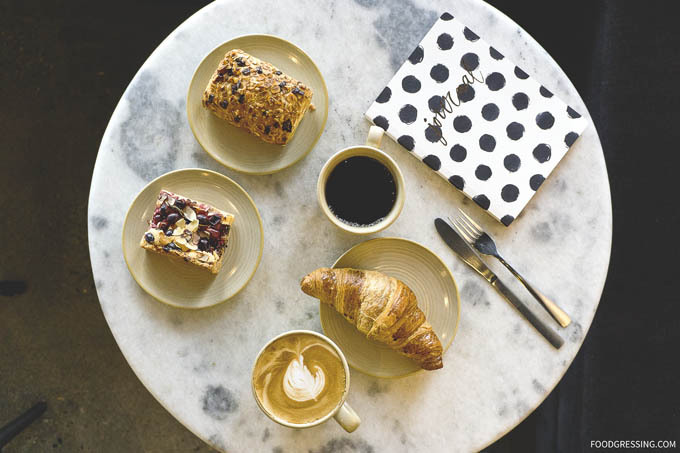 The chocolate hazelnut crunch, cranberry blondie and butter croissant were scrumptious treats to go with a delicious coffee. I also found that the green tea latte and the toasted seed roll made a good pairing. For a lunch and dinner, Good Earth’s salad, soups and flatbread make excellent choices. 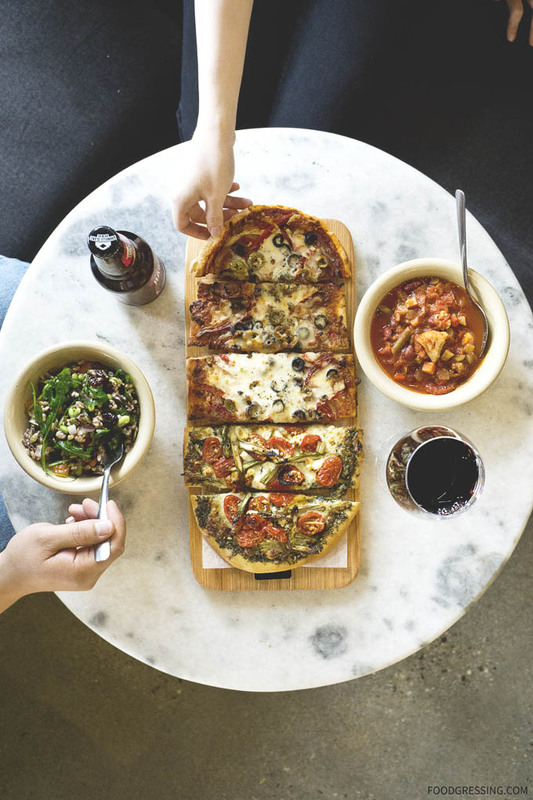 I tried the minestrone soup, wild rice and edamame salad, kale pesto flatbread and Sicilian flatbread. Be sure to get a cold beer or a glass of red wine for good measure. The flatbreads were very tasty with a good topping to dough ratio. I highly recommend them. 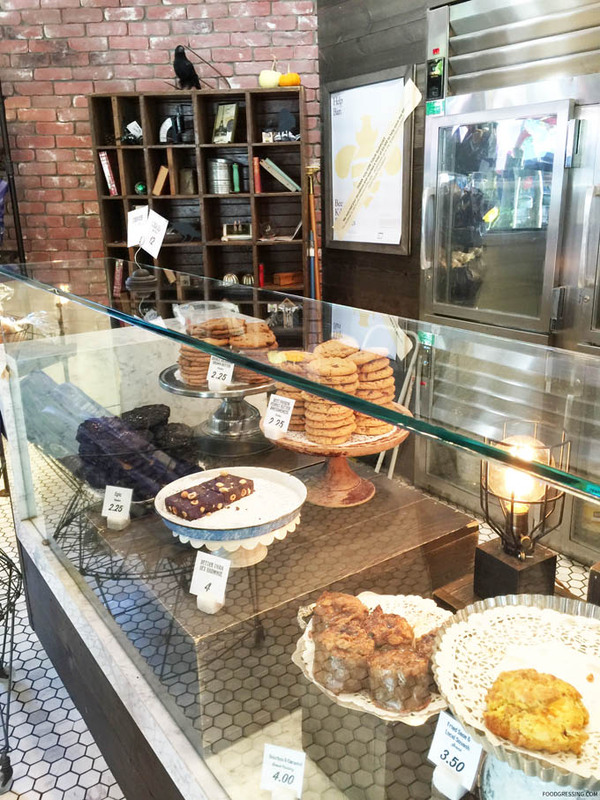 Want to Try Good Earth Coffeehouse? I am giving away to four winners each a $50 dollar gift card to Good Earth Coffeehouse. The giveaway is happening on this blog post and on my Instagram. I will select two winners from each. Blog giveaway ends November 21, 2016 23:59 PST. Open to residents of Metro Vancouver only. 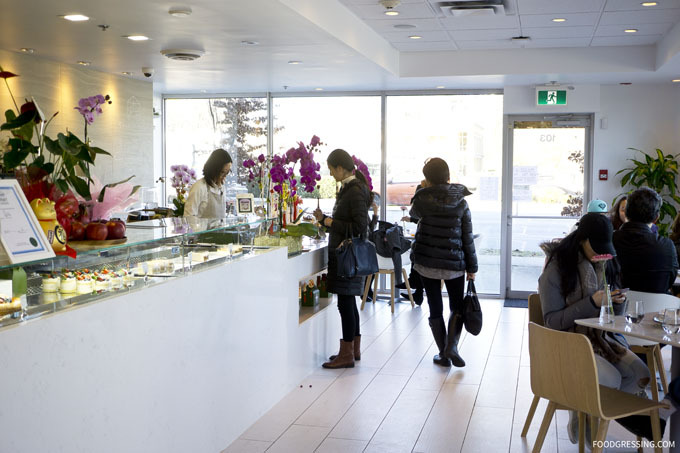 @GoodEarthHq now has two locations in Metro Vancouver (Alma and Capilano University)! Here is your chance to try them out. 4 followers (2 on Instagram and 2 on the blog) will each win a $50 gift card ☕️ To enter on Instagram: – 1⃣ LIKE this post 2⃣ FOLLOW @GoodEarthHq + @Foodgressing 3⃣ TAG a friend (unlimited entries but must tag different friends each time) – Giveaway closes Monday, November 21 at 22:00 PST. Open only to Metro Vancouver residents. ☕️ – Per Instagram rules, we must mention this is in no way sponsored, administered, or associated with Instagram, Inc. By entering, entrants confirm they are 13+ years of age, release Instagram of responsibility, and agree to Instagram’s term of use. Good Earth Coffeehouse Alma is now open at 2505 Alma Street. Hours of operation are Monday – Saturday from 6:30 am to 9:00 pm, and Sunday 7:00 am to 8:00 pm.